Is Keyword Density still Important? and What About Semantic Search? As search engines and their algorithms evolve, how they evaluate or handle keywords have changed. For example keyword density or the number of times a keyword phrase appeared within the content of a web page use to be a big deal, now not so much. Keyword density is calculated by counting the number of times a keyword (or phrase) appears on a page, then dividing that number by the total number of all words on the same page. The percentage, would then be used as a factor for how a page would rank in the search results. Does Keyword Density Still Have a Place In SEO? First of all, let me set the record straight, keywords still matter. However, instead of worrying about trying to strike the right balance for keyword density, you are better off writing good quality content that uses a semantic keyword mixture of words that help support the primary or focus-keyword. What I mean by this is choosing keywords that are relevant to the topic of the page while also can be associated with the focus-keyword. For example, car, four-door-sedan, Audi and auto mobile review and test drive would all have a semantic relationship. Writing content from a semantic perspective be of better quality and add the best value and user experience for the searcher/visitor. Note: Google Hummingbird update in August 2013 helped to usher this way of thinking into SEO. 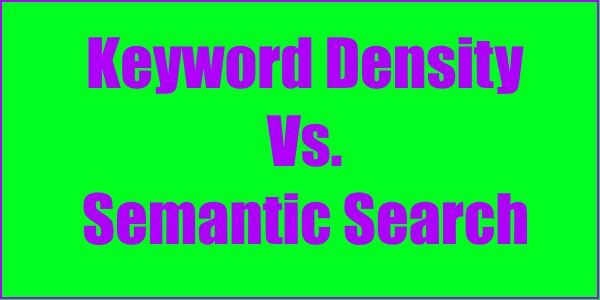 Alexis Sanders, has a great write up about Semantic search in her article on Moz.com titled: What Is Semantic Search and What Should You Do About It? David Amerland wrote an entire book on the subject of Semantic Search, you can buy it on Amazon.com. In today’s content marketing world there is less of a reliance on keyword density and much more on understanding the total or overall search process. In one of his “Whiteboard Friday” video posts, Rand Fishkin of Moz.com lays down a challenge to content producers to and shares the criteria for producing unique value-added content that stands out in this crowded web. To stand out content must be freshly presented in order for Google to index it and place it above all others… Here is a little more on each point… But you need to watch the video! If you are going to be producing content you should strive to meet these five criteria or standards. 1. Unique – One of a kind content written in such a way that the search engines have never seen it laid out and stated in the way you are presenting and does not appear else where. 2. Relevant – Content that is on-topic to both search engines and visitors query and intent. It needs to be exactly what they were looking for. 3. Helpful – It should resolve the searcher’s query in a useful but efficient manner. 4. Uniquely Valuable – Provides information that’s unavailable or hard to get elsewhere. The content has been presented in a way that has never happened.